Thought I would share my custom UIs. All of these have been stitched together from pieces of various UIs and then edited/recolored/modified to work on project 1999. I put a lot of hard work and time into these but I make no claim over ownership of the original materials. In games gifts are welcome if you like and want to show appreciation. Also, thanks to Norova/Welgrim for providing a 3rd mirror. He hosts a ton of p99 related things @ http://p99.yourfirefly.com/. Be sure to check out his page and toss him a donation! 1. Unzip the file you downloaded. 2. Place the two folders "leewongUI-horz" and "leewongUI-vert" inside the "uifiles" folder located in your EQ directory. 3. Load EQ and select the skin "leewongUI-horz" for horizontal hotbars or "leewongUI-vert" (pictured above) for vertical hotbars. Set your Fade To Transparency (under Options) to 85-90 for best viewing. 2. Place the two folders "leewongUIblue-horz" and "leewongUIblue-vert" inside the "uifiles" folder located in your EQ directory. 3. 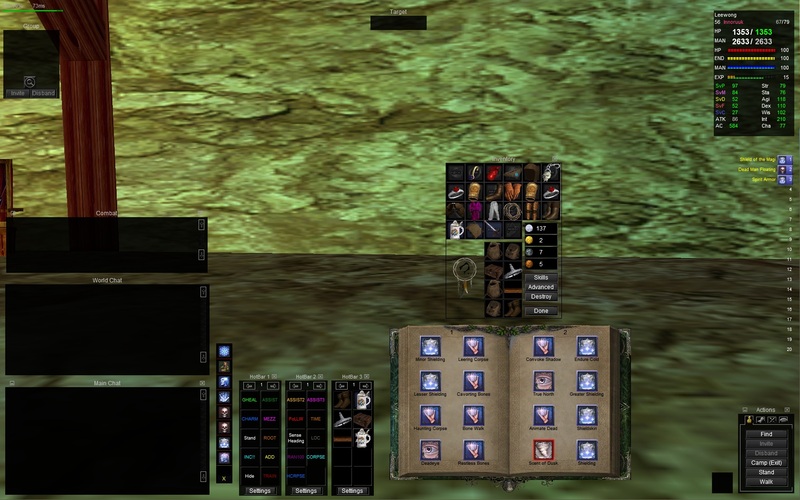 Load EQ and select the skin "leewongUIblue-horz" for horizontal hotbars or "leewongUIblue-vert" (pictured above) for vertical hotbars. 2. Place the two folders "leewongUIclear-horz" and "leewongUIclear-vert" inside the "uifiles" folder located in your EQ directory. 3. Load EQ and select the skin "leewongUIclear-horz" for horizontal hotbars or "leewongUIclear-vert" (pictured above) for vertical hotbars. Set your Fade To Transparency (under Options) to 85 for best viewing. 2. Place the two folders "leewongUIgreen-horz" and "leewongUIgreen-vert" inside the "uifiles" folder located in your EQ directory. 3. Load EQ and select the skin "leewongUIgreen-horz" for horizontal hotbars or "leewongUIgt-vert" (pictured above) for vertical hotbars. 2. Place the two folders "leewongUIbrown-horz" and "leewongUIbrown-vert" inside the "uifiles" folder located in your EQ directory. 3. Load EQ and select the skin "leewongUIbrown-horz" for horizontal hotbars or "leewongUIbrown-vert" (pictured above) for vertical hotbars. Copy and paste the "EQUI_CastSpellWnd.xml" to the UI folder you want to use it in. Last edited by leewong; 01-14-2015 at 01:30 AM..
You should post larger screen shots! Posted a link to each screenshot. You need to copy the links and paste them in a new navigator window/tab for the images to load properly. At least that worked for me. PLOT THICKENS, IS IT VIRAS? Every song I play is actually just me screaming the 1812 Overture in a raspy, shrieking falsetto.